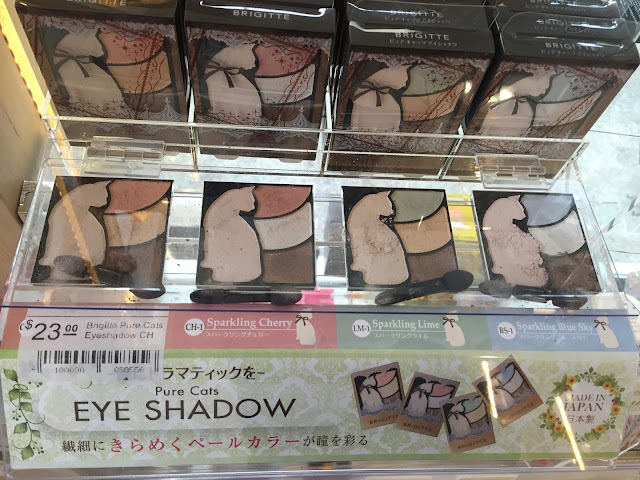 Longtime readers of my blog will know that I've struggled with eyeliner for my entire makeup-wearing career, which now spans six years. One of my first ventures into makeup involved a black Maybelline pencil eyeliner, with which I drew awkward, thick lines across my upper lashline. 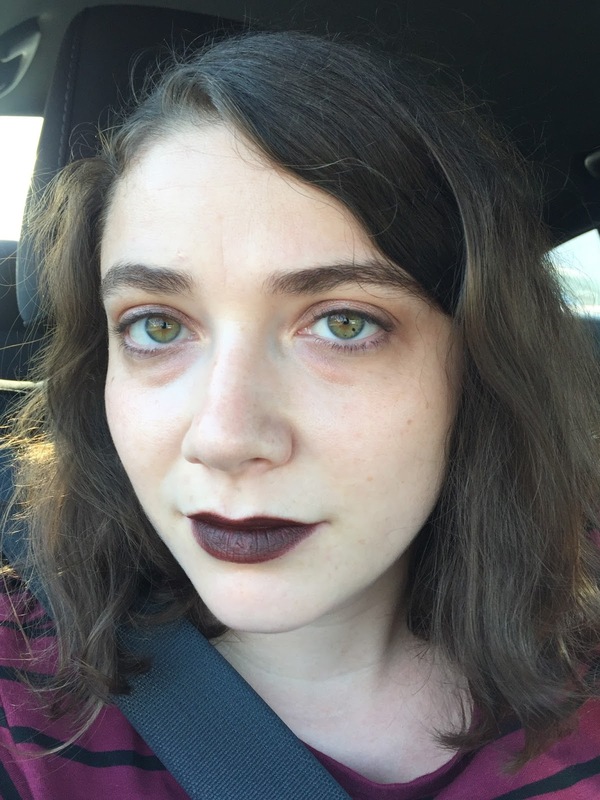 To my credit, I soon figured out that this looked terrible, but my second attempt wasn't much better: I spent a good three years trying on and off to perfect a cat eye with a black liquid liner, Maybelline Line Stiletto in Blackest Black. I was eventually forced to conclude that the outer folds of my eyelids would always foil my attempts to wing out my liner. Cat eyes were just not going to happen for me, no matter how many articles and YouTube tutorials swore that everyone—yes, everyone—could achieve Elizabeth-Taylor-in-Cleopatra perfection. 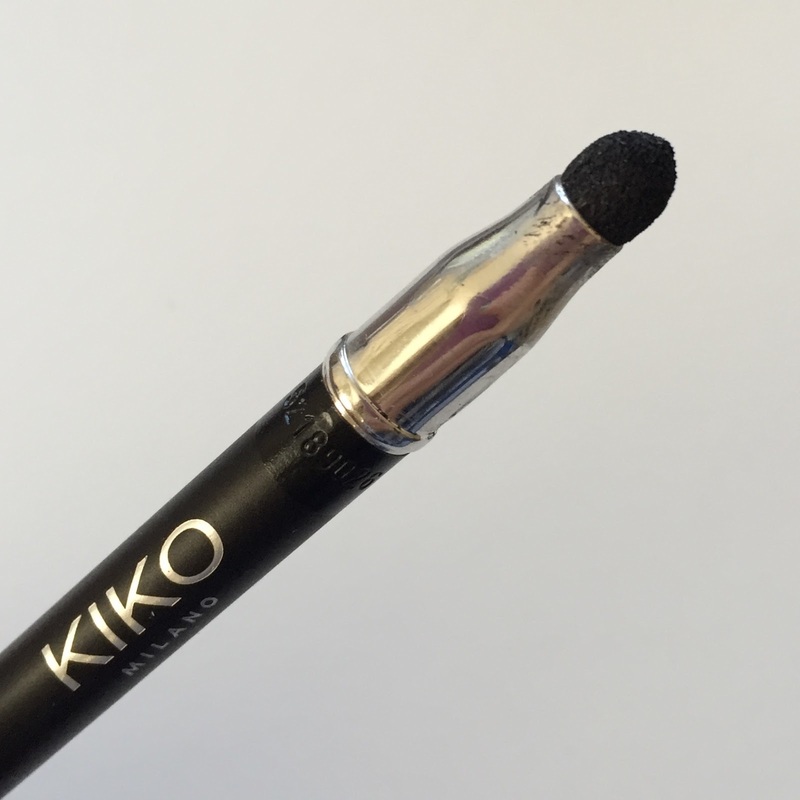 Finally, I settled on black or dark brown eyeshadow smudged along my lashlines with a narrow brush. 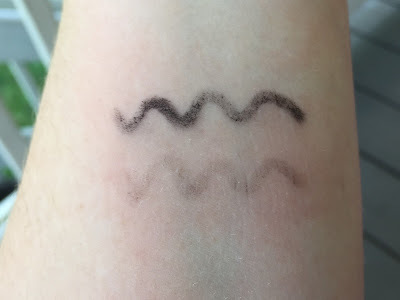 That gave me a bit of definition without the challenges of a pencil or a felt-tip applicator, and I resigned myself to not being an eyeliner person at all. Though I started out smudging these two pencils along my upper lashline, I've since worked out a technique that I think approximates tightlining. Maybe it really is tightlining? I don't know. My understanding is that tightlining involves the upper waterline and, as a contacts-wearer, I shudder at the thought of putting pigment there. Instead, I pull my mobile lid taut and draw the thinnest line possible along my lashline, making a series of little dashes and working the color into the spaces between my lashes. This was very difficult at first (unsteady hands, uncontrollable blinking), but after a month of practice, I'm getting it right almost every time. 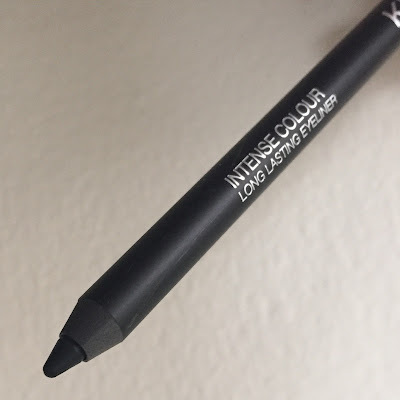 Ironically, I've returned after all these years to a refined version of the first eyeliner technique I ever tried. Demolition ($20 at Sephora) has a very soft and pigmented formula. The texture presents challenges as well as advantages. 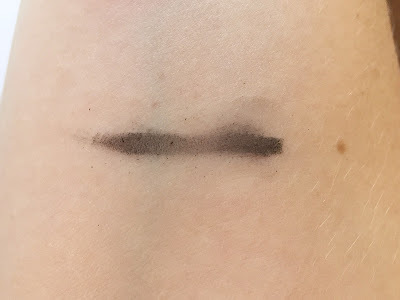 When I smudge Demolition along my upper lashline, some color always leaps with ninja-like stealth to my lower lashline, if not immediately then in a couple of hours. I'll be congratulating myself for executing a decent eye look for once in my goddamn life, and then I'll notice that half the pigment has managed to transfer itself to the already-dark spaces below my eyes. This was the problem that forced me to work out my tightlining technique, and when I don't smudge the liner, it stays in place almost all day. But I think $20 is a high price to pay for an eyeliner that disappears as quickly as Demolition does (soft formula = more frequent sharpening), and after I use up Demolition, I might cast around for a cheaper alternative. Full face, with Sleek Life's a Peach blush and Revlon Fire and Ice lipstick (I'd just seen Hitchcock's To Catch a Thief and was captivated by Grace Kelly's taupe and coral makeup). As you can see, Black doesn't read as EYELINER! here so much as a bit of extra definition. 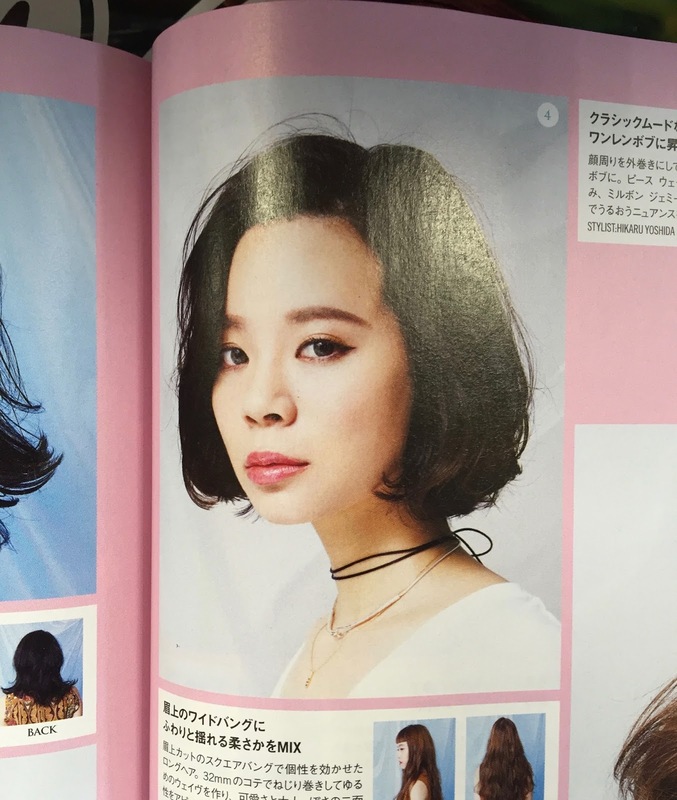 Since my eyes are large and quite deep-set, too much definition can throw off the balance of my face. I can remove Demolition with my usual cleanser, Lush 9 to 5, but I need bigger guns for Kiko: namely, Vaseline on a tissue. Forget micellar water, coconut oil, whatever you kids are using these days: there's no more effective eye-makeup remover than plain old petroleum jelly (I don't even buy the name brand). And there you have my adventures in eyeliner for the last nine months or so. I'm still a bit sad that cat eyes continue to elude me, but I'm glad to have found an eyeliner method that works for my eye shape and aesthetic preferences and doesn't slow me down when I have somewhere to go. 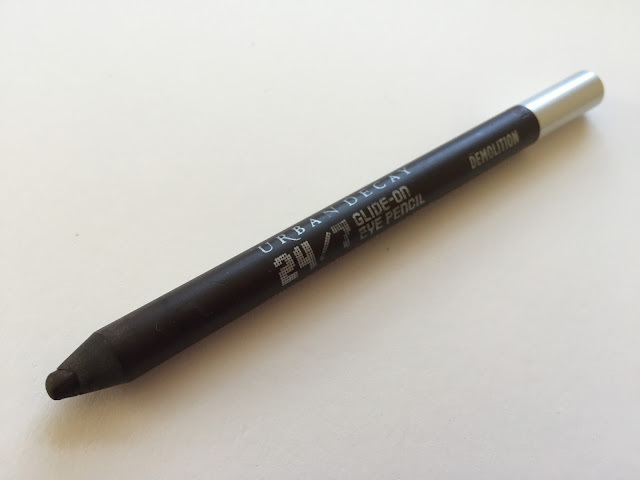 What are your favorite pencil eyeliners? Left, top to bottom: Violet Voltage, Charmed, Beach Casual, Unicorn Fur, Midnight Muse (two coats), Foul Mouth (Liquid Suede). Right, top to bottom: Duchess, Foul Mouth again, Alien (Liquid Suede), Midnight Muse (one coat), Disorderly. Not bad, but not the color I was expecting. 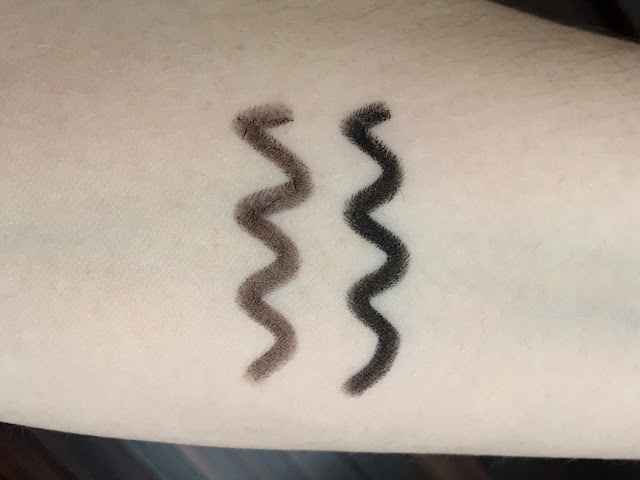 So I went back to Ulta and exchanged it for Midnight Muse (they're the same price: $6.99), which turned out to be much closer to the color I wanted. It's a pretty dead-on dupe for KvD Poe as well, though of course it lacks the pink sparkles that make Poe unique. The Velvet Mattes and the OG NYX mattes come in similar no-frills black-and-clear tubes, though the black of the Velvet Matte tubes is, well, more matte. Here's Midnight Muse atop a postcard with an 1890s image of the now-ruined Sutro Baths: vaguely Miévillian, I thought. 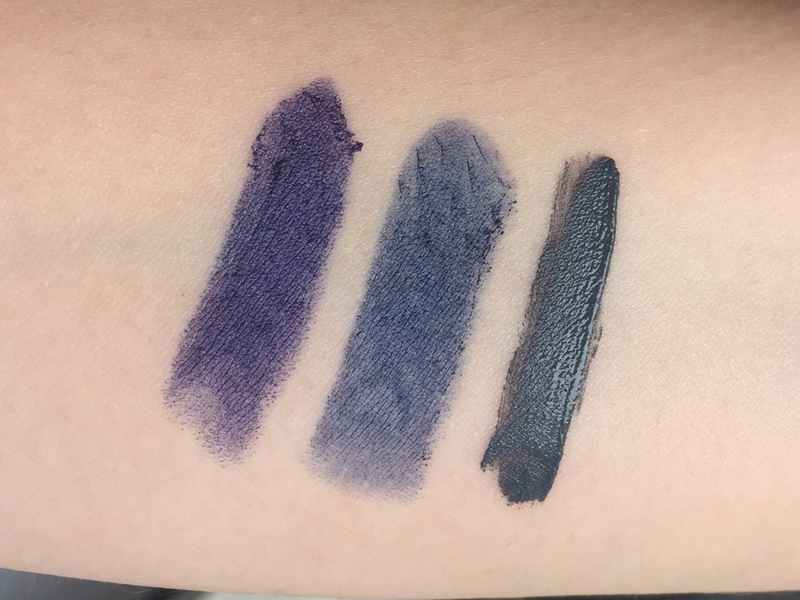 Midnight Blue is brighter and more purple than Midnight Muse, which contains a bit of gray. MB looks more opaque than MM in this photo, but its slippery texture actually makes it a bit streaky on the lips, and it fades quickly. My mom is a germaphobe and wouldn't let me try on Midnight Blue, so I'm working off what I observed when she wore it to dinner one night. We're outside in the early evening here, so the light is pulling everything a little warm. Unfortunately, Midnight Muse's formula leaves something to be desired. 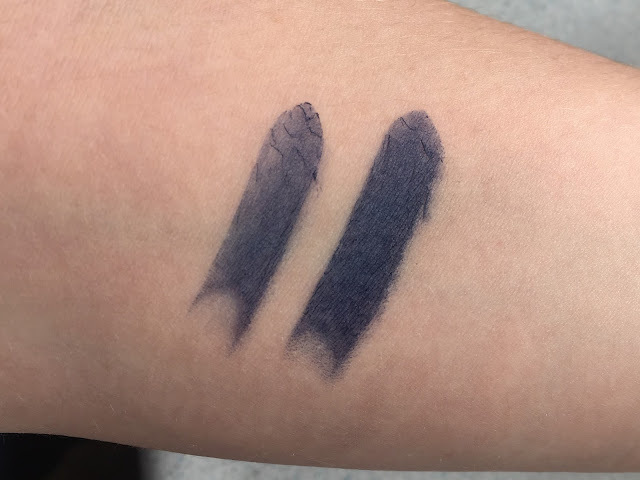 It's not as patchy on the lips as it looks in the arm swatches above, but it needs two or three coats for full opacity, and I have a hard time getting it to adhere to the inner part of my lower lip. 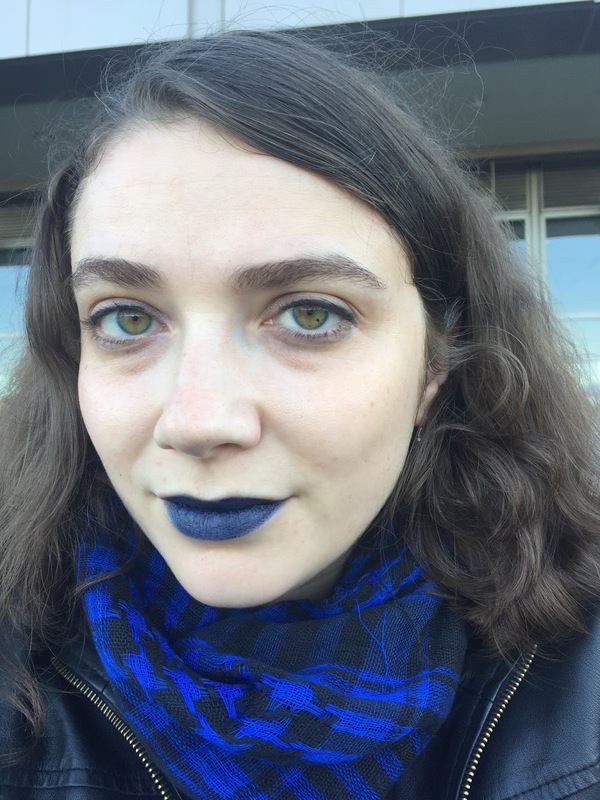 The dryish texture gives it more lasting power than a slick lipstick like Midnight Blue, but it does fade with eating and drinking (though it doesn't transfer much), and faded navy lipstick isn't cute. It also feels a bit tacky when I press my lips together, which I don't mind but some people might. 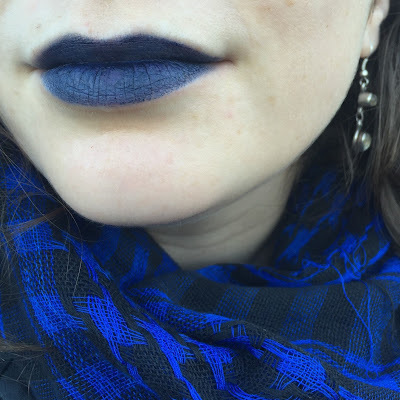 However, I'm happy to report that though Midnight Muse is dry and almost totally matte, it's not drying: in fact, it's comfortable to wear and leaves my lips slightly hydrated. And even with all these caveats, Midnight Muse is no worse than Poe. 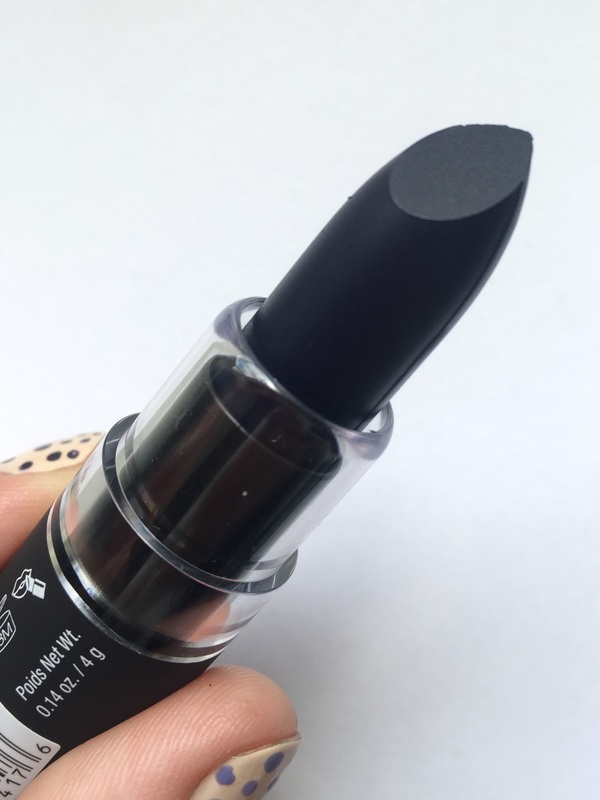 Almost any bullet lipstick in a weird dark color is going to be somewhat high-maintenance. 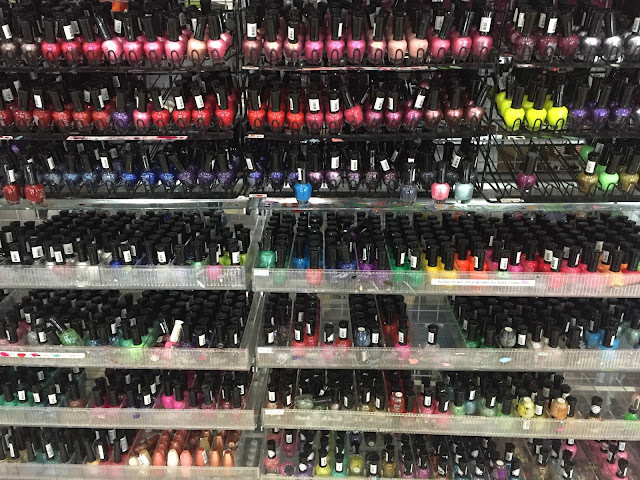 It's up to you to decide whether the color is worth the maintenance; for me, it is. None of the problems I've listed is a dealbreaker for me, as extreme dryness or slipperiness would be. ...and outdoors, before cocktails at the Slanted Door (the light glinting off the bay clearly washed me out a little). These photos were taken on the same day; I'm wearing NARS Lhasa eyeshadow, Kiko Intense Colour Long Lasting Eyeliner in Black, Illamasqua cream blush in Zygomatic, and probably a bit of ColourPop Lunch Money highlighter. As with Stone Fox, I'm surprised at how comfortable I feel in this offbeat shade. 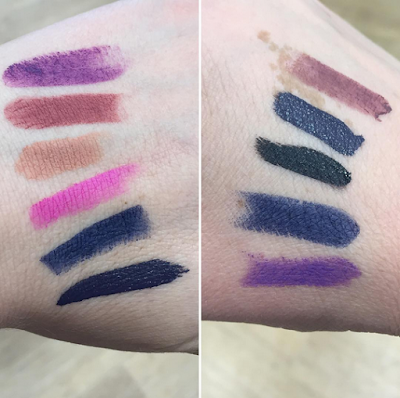 I've long gravitated toward dark lip colors—plum, mahogany, burgundy—and Midnight Muse seems closer to those colors than it does to lighter, brighter blues. 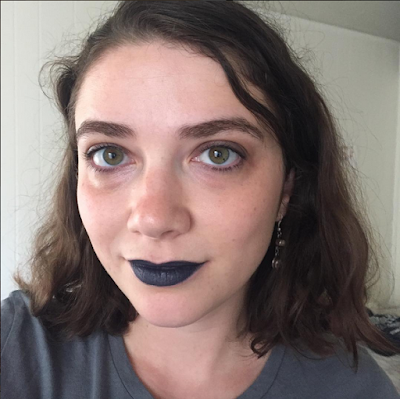 Unlike Bellis Coldwine, I won't be wearing my navy lipstick to the library this fall, but I suspect it will get a fair amount of wear. Even though I don't live in a floating pirate city—yet. 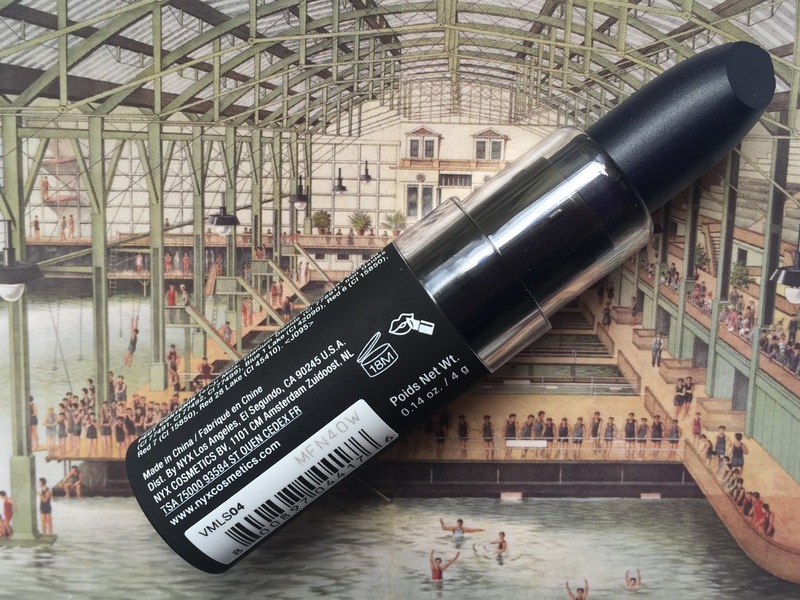 Given the subject of this post, I'd be remiss not to mention one of the best items in Sephora's current end-of-summer sale. The Studded X Mini Lip + Nail Polish Duo ($7.50, reduced from $15) features a mini Kat Von D Studded Kiss lipstick and a matching Formula X nail polish. Poe is still available, as are Coven (matte lavender) and Slayer (matte black). I ordered Mercy (metallic berry) last night, but it has since sold out. Despite my misgivings about Kat Von D as a person, I've been curious about her brand for a long time, and I've been impressed with both of the Formula X polishes I've tried. Worth a look if you're drawn to navy lipstick but don't want to splurge on a full-sized one! I've spent the past two weeks in dissertation jail, bouncing between several of San Francisco's fine coffee shops while completing an extensive rewrite of my Hobbes chapter. With the help of massive doses of caffeine, sugar, and k-pop (I'm good, I'm hot, I'm fresh, I'm fly! ), I wrapped up the damned thing yesterday and sent it to my committee. I started writing this post a week ago and have been typing a few lines a day in my spare moments, but it feels so good to finally have enough time to finish it. Of course, I have to start reworking my job materials almost immediately after this, but today is a day of freedom. My daily view while waiting (sometimes up to 20 minutes: SF's transit system is notoriously dysfunctional) for the streetcar. As many of you know, I grew up in San Francisco and come back twice a year to visit my parents. The city has changed dramatically (mostly in the direction of aggressive gentrification) since we moved here in 1995, but a surprising number of my old haunts have clung to life. 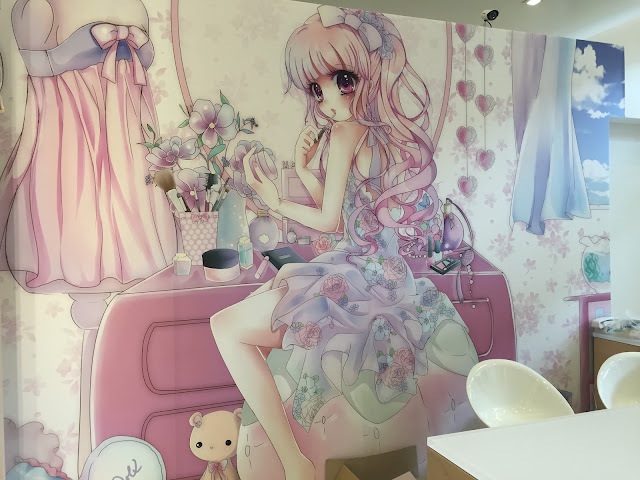 One of those haunts is the Japan Center, a mall in Japantown where I spent many an afternoon in high school, eating crepes and buying elegant notebooks and cat-shaped erasers. 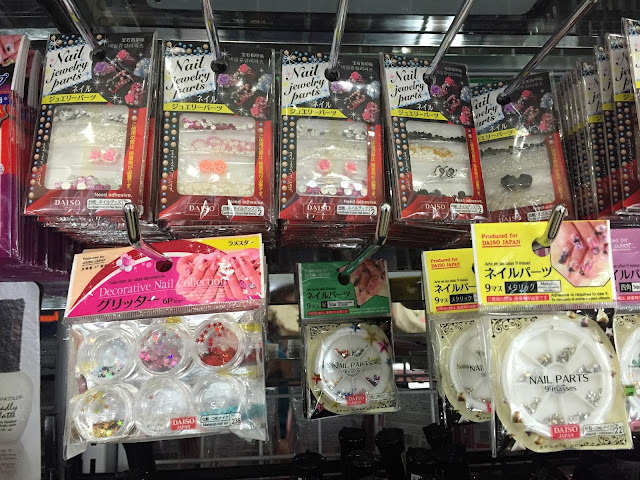 Most of the stores I remember from ten or twelve years ago are still around, but my interests have shifted since then. 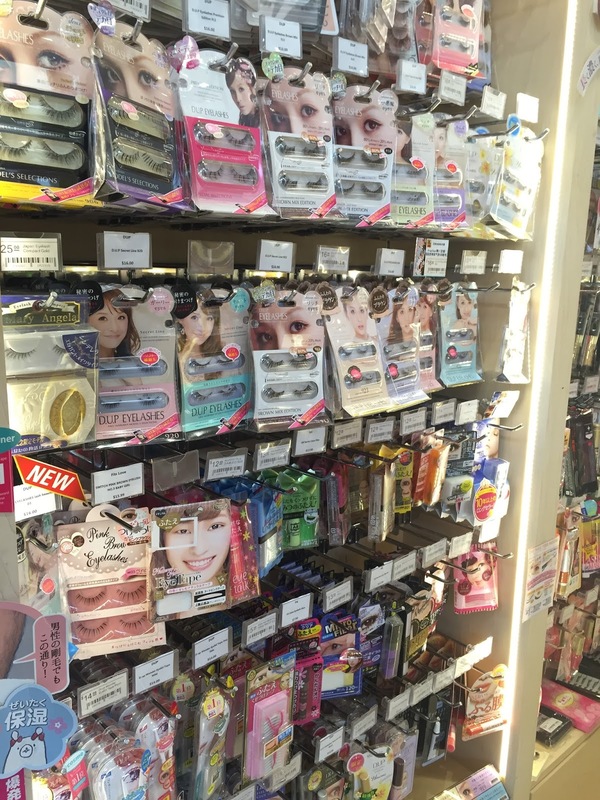 I didn't care much for makeup when I was 16, but in the last two years I've discovered that a number of stores in Japantown carry Asian beauty products that are hard to find elsewhere in the States. 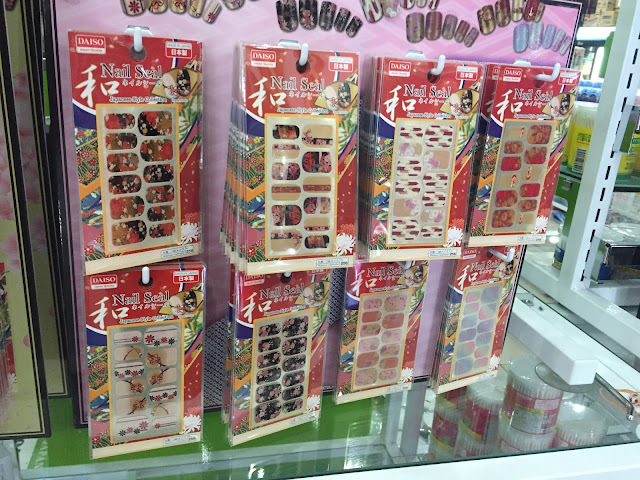 I spent some time there with my high-school friend Jenny last week, and I thought it might be fun to give you a virtual tour of what San Francisco's Japantown offers devotees of sheet masks, lip tints, and nail stickers. Warning: this will be a photo-heavy post! Our first stop in the Japan Center is a place I've been visiting since high school: the San Francisco branch of the Japanese bookstore chain Kinokuniya. 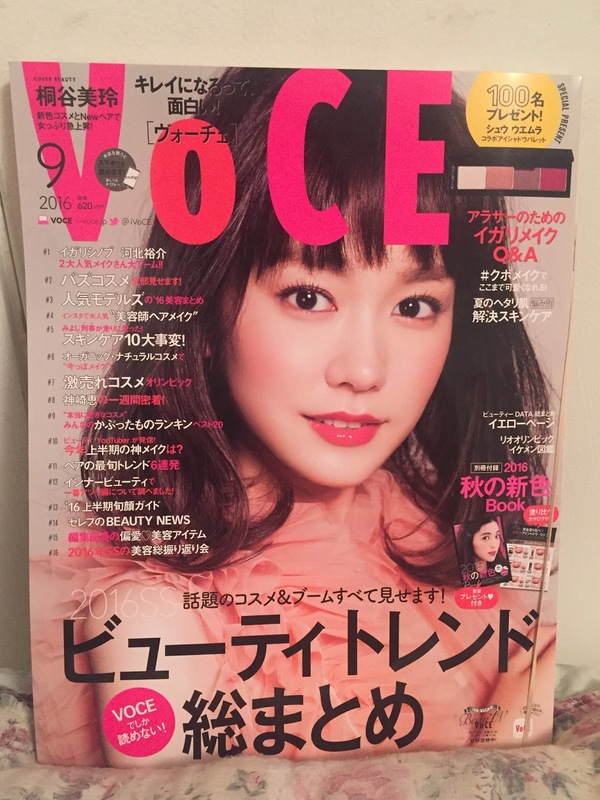 I studied Japanese for nine years, from sixth grade through sophomore year of college, and though I'm nowhere near as fluent as I was at the age of 19, I still like buying the occasional Japanese fashion or beauty magazine to help refresh my vocabulary. 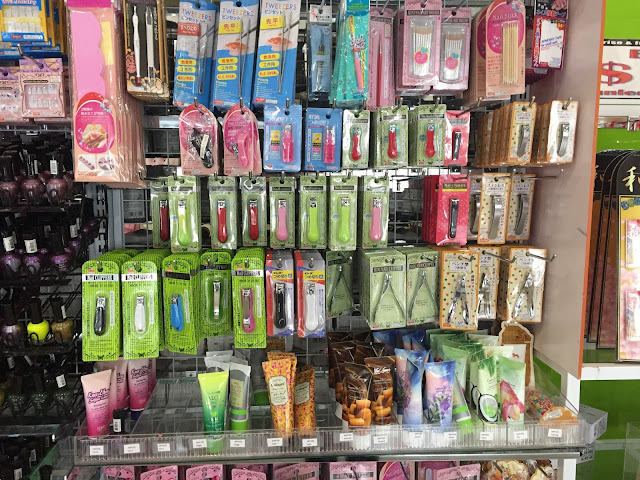 In Japan, such magazines often come with skincare samples, but since many Asian skincare products haven't been approved by the FDA, Japanese magazines usually reach American shelves stripped of their samples. 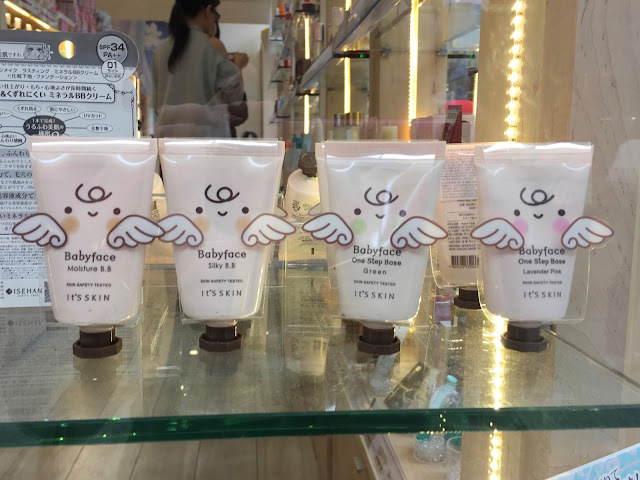 Because, you know, all Americans have a God-given right to stockpile assault rifles, but heaven forbid we come into contact with a foreign moisturizer. Speaking of contraband skincare, I managed to find Bioré Aqua Rich Watery Essence somewhere in the Japan Center (I ordered my first tube on Amazon, it took three weeks to ship from Yokohama, and I just ran out). 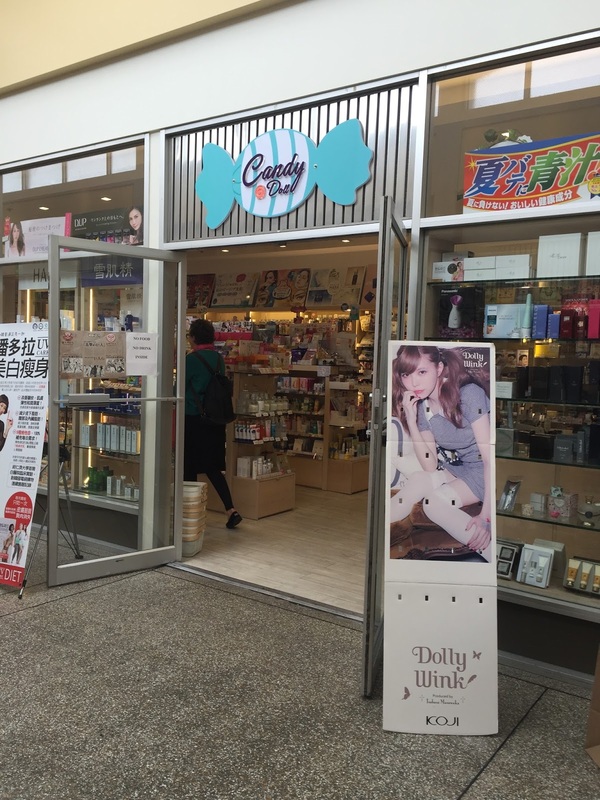 Since I'm pretty sure it's technically illegal to sell that divine sunscreen here, I'm not going to name the store where I bought two precious tubes for $15 each. Just know *conspiratorial whisper* it's available. As adorable as these tints are, I wonder why the shade ranges are always so predictable: fuchsia, orange, pinky red, maybe a plum if you're lucky, but nothing too dark or purple or brown. I saw a price sign for the wine-bottle-shaped Labiotte lip tints, which I've been curious about for some time, but the tints themselves were nowhere to be found. ...though the Brigitte Pure Cats eyeshadow palettes are a close runner-up. I've never heard anything about this brand; I suppose Paul & Joe is hogging the cat-lady spotlight. 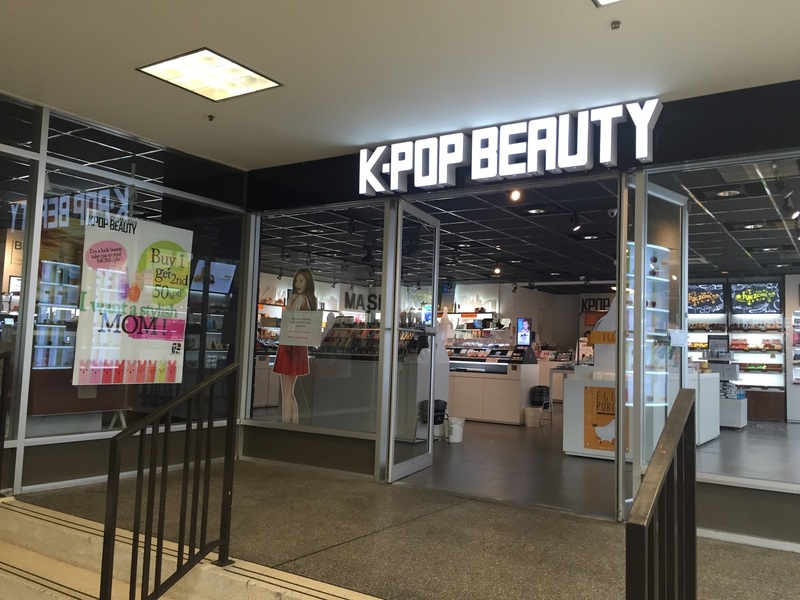 Since then, the storefront seems to have undergone the same fate as 4Minute, which disbanded in June. All of K-Pop Beauty's merchandise is by Tony Moly, but the posters on the walls have "Tony Moly" very obviously crossed out, and of course there's that odd name change. I would have asked one of the employees what was up, but I assumed their lips were sealed. 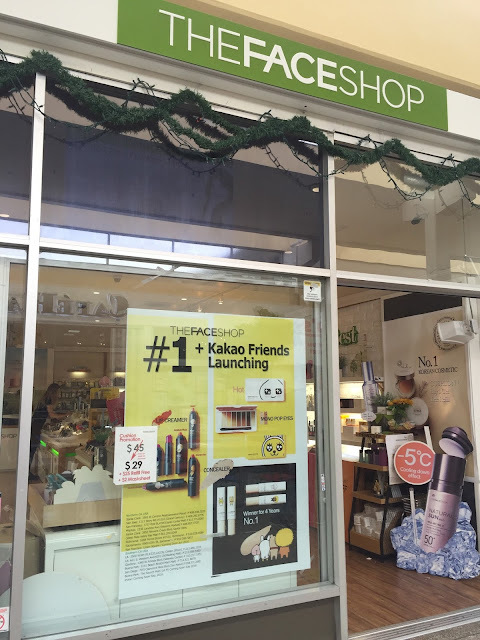 My best guess is that this particular franchise of Tony Moly lost its license and is now trying to liquidate its stock and get the hell out of Dodge (that would also explain the cardboard boxes piled in a corner of the store). Interestingly, Sohyun, the youngest member of 4Minute, was recently spotted selling her former group's merchandise at a flea market. The parallels are uncanny. 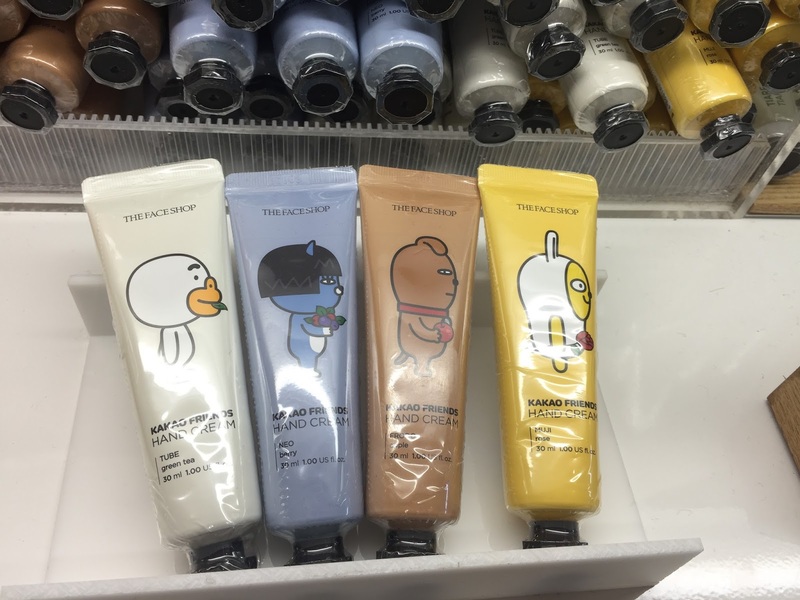 Here's a question, though: if K-Pop Beauty is trying to get rid of all its lip tints and sheet masks, why hasn't it followed Sohyun's lead and lowered its prices? Let's move on to a more legitimate business: The Face Shop. I couldn't resist buying the glitter stars in the photo above, as well as a pink nail-dotting tool with which I've already done two manicures (post to come). 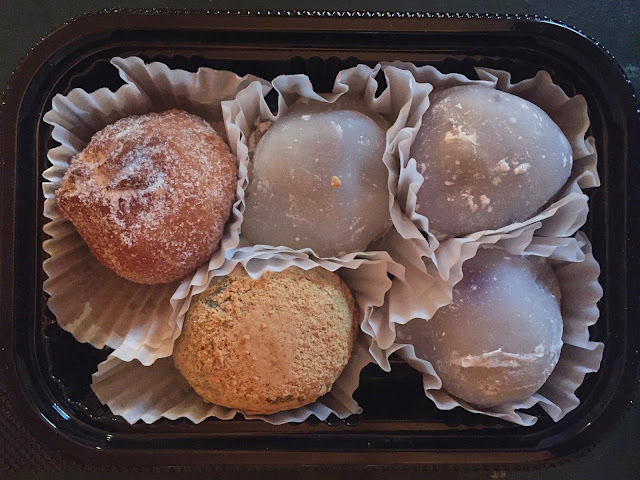 If you're feeling peckish after all that beauty shopping (and even if you're not), no visit to Japantown is complete without some fresh mochi from Benkyodo, a bakery and diner that's celebrating its 110th anniversary this year. (Quick vocabulary lesson: "mochi" is the glutinous rice paste itself, as well as an umbrella term for the confectionery made from it; "daifuku" is the round, filled sweet that most of us think of when we hear the word "mochi.") The summer is a particularly good time to visit Benkyodo, since they often have daifuku filled with fresh strawberries or blueberries along with the usual sweet white-bean paste. 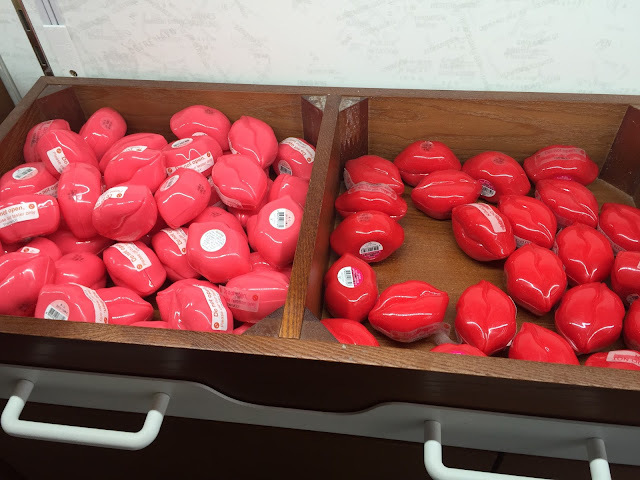 I've eaten a lot of mochi in my life, in Japan as well as the US, and Benkyodo's strawberry daifuku is the best I've ever had. Top row: age (donut filled with adzuki-bean paste), daifuku with adzuki bean, daifuku with fresh blueberries. Bottom row: green daifuku colored with mugwort, filled with sweet white bean paste, and topped with kinako (roasted soybean flour); blueberry daifuku. 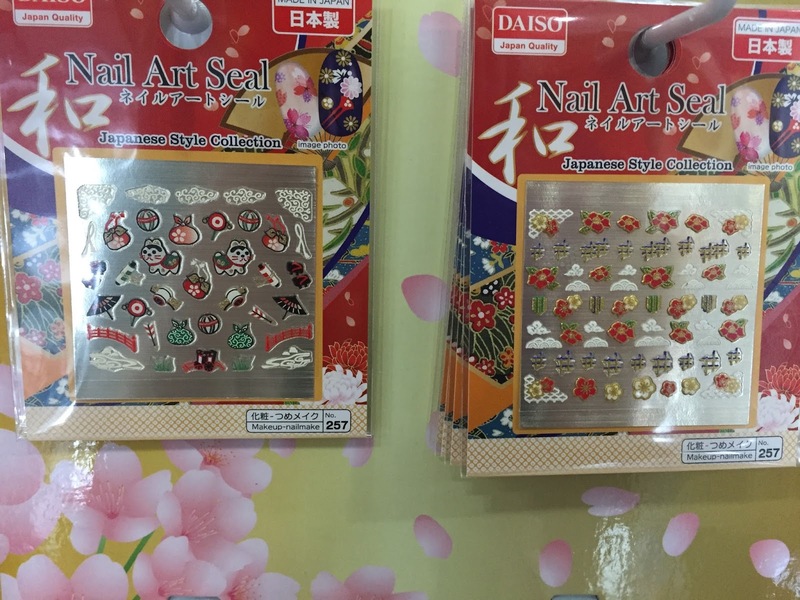 And that concludes our tour of Japantown! 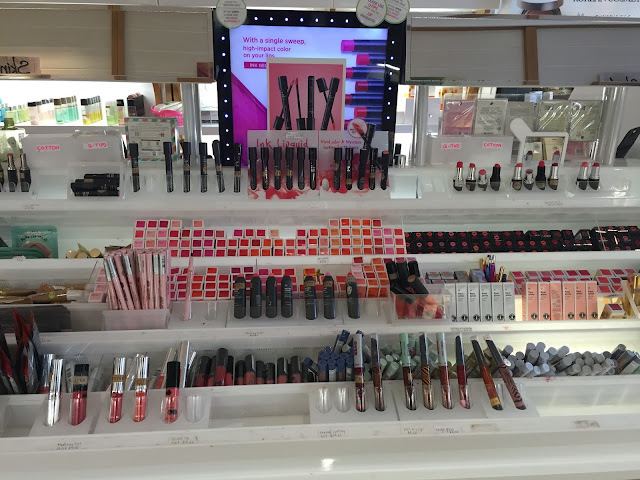 I doubt the Japan Center can hold a candle to, say, Toronto's Pacific Mall for sheer variety, but it's still a great place to poke around if you're a beauty lover passing through San Francisco. Have you ever visited?